Commentary: Repack, retool, redeco, repeat. You might not have this figure, but even if you do this AT-DP Pilot is a redeco - and seemingly slightly downsized and tweaked - figure is clearly different. The feet have different markings, too. It's also a redecorated pilot, slightly shorter and with different textures and a couple of other tweaks, with a redecorated and retooled bike. It's different enough to be worthwhile, but the $19.99 price is a little wince-inducing when you open the box and see that it's about 90% air with the bike fully preassembled. 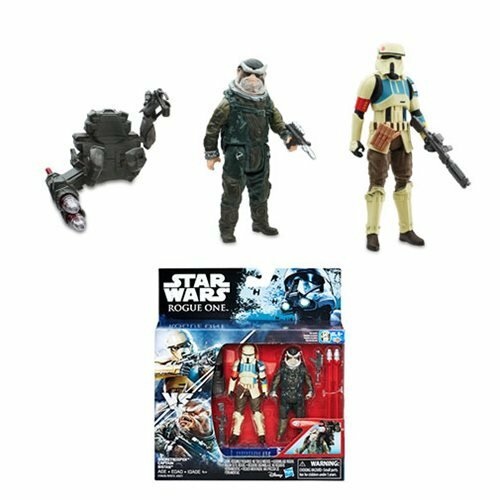 Hasbro mastered the skills of the puffer fish when it came to The Force Awakens packaging, and continues it here - with this vehicle making up half the assortment along with the Imperial Walker and Ezra Speeder vehicles. The AT-DP Pilot is the AT-DP Pilot from 2015 [FOTD #2,134] design, more or less, but like 3% shorter and seemingly squirted out by a slightly different method than the original. 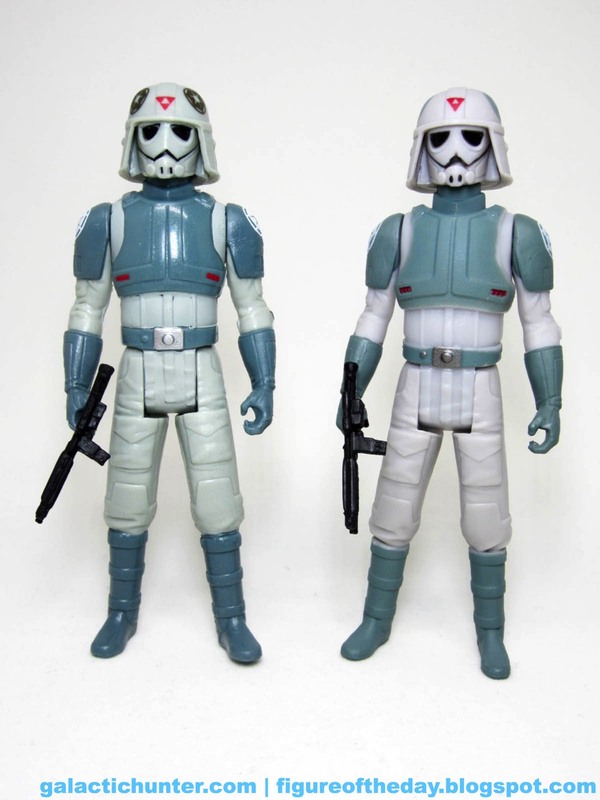 He still has the same 5 joints and basic layout, but he looks completely different in a side-by-side comparison. The new figure has a matte finish, molded in a light grey that's less blue than the 2015 one. 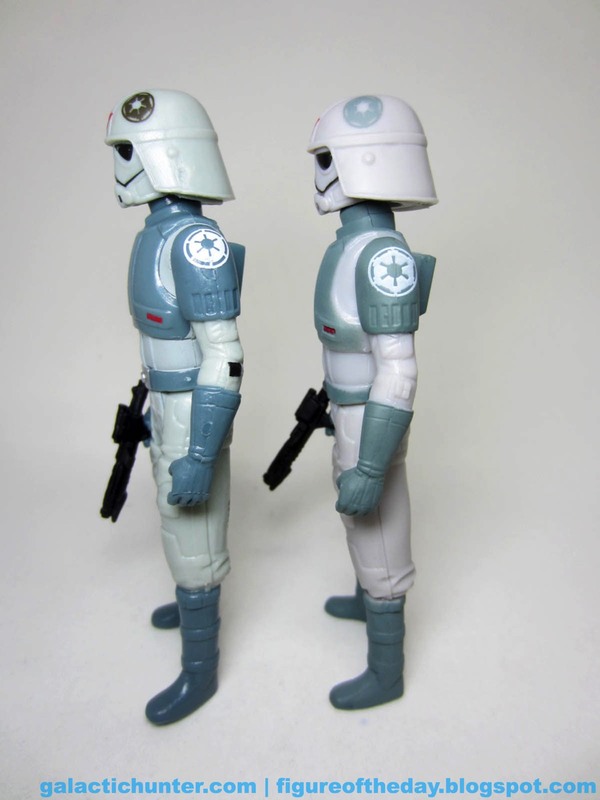 It also has Imperial shoulder logos rather than the Republic logo, which look so much alike Hasbro has switched them on a fairly regular basis. The paint masks all seem a little different too, with things being a bit sharper this time. 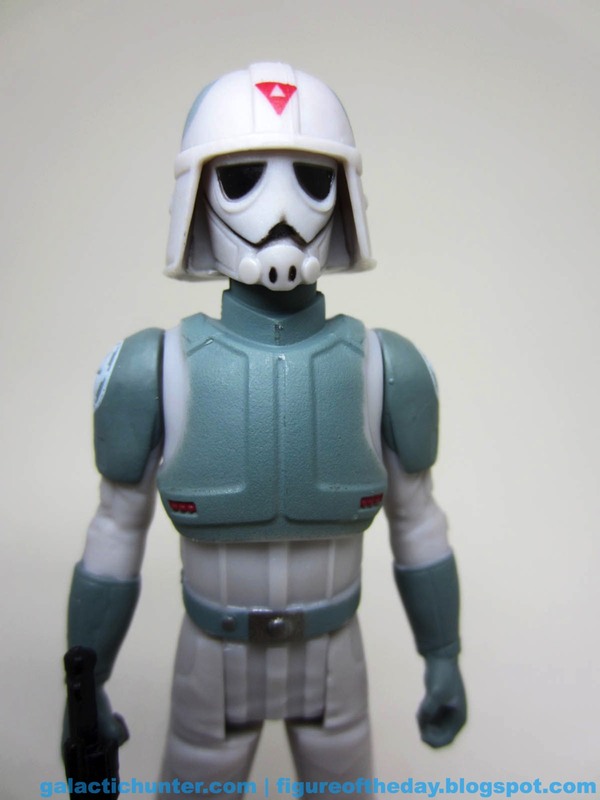 His helmet markings are also slightly different colors and shapes. The new one has a lighter pair of markings. The animation models aren't always colored the same, so some look kind of like this one and some look kind of like the other ones. 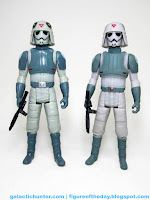 There's no real "better" here, if you're a troop fan that understands you can buy the same guy 20 times and it's arguably not always army building, this is a figure for you. Sometimes they even have light grey/white Imperial symbols with a black inverted Triforce, so there are more ways to do it still. 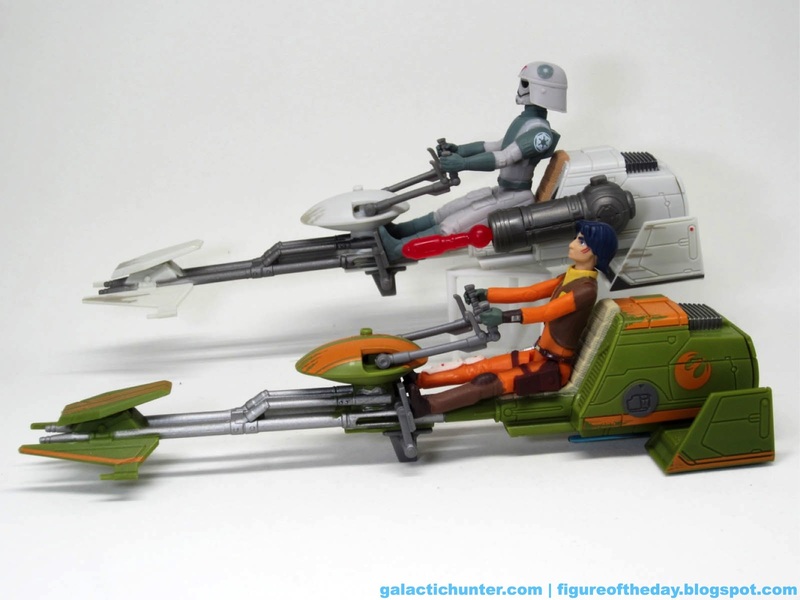 The bike itself is a toy'd up version of the show model. Ezra's bike was a little more garish, but decent. The Imperial version adds a firing rocket to the side, spring-loaded despite having what seems to be a "marble shooter" rocket in there. It's peculiar. It appears to be removable if you take the toy apart, but I won't be doing that. The bike has some light weathering deco, which is a real rarity nowadays, so it looks pretty sharp as a physical toy of the old preliminary speeder bike sketches of Joe Johnston - who has had quite a few awesome toys made of his designs, many of which are attributed to another famous concept artist. 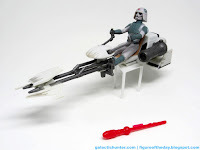 The bike itself has adjustable handle bars and foot pedals, as the vehicle was exquisitely designed to fit shorter figures like Ezra or taller figures like this pilot. 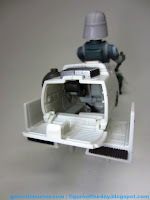 You can store the blaster in a compartment in the rear - I love this - and it retains the lightsaber storage on the bottom as well as a little hole that seems like you could plug a tiny gun on there, like the original 1983 Kenner Speeder Bike. While it doesn't do much other than shoot and look cool, I'd say this is a can't-miss set for the old guard. It's a concept vehicle in cartoon disguise - you recognize the build, you've seen the designs. You may have thought about how cool it would be to have one of these since you saw it in the old sketchbooks, so for that reason, I'd say get it now. 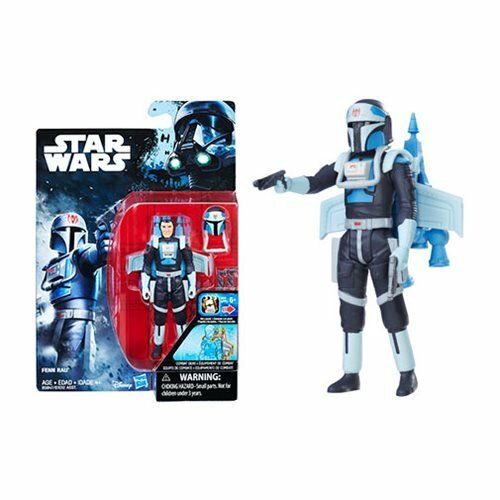 If this were $15 I'd say you'd feel it was a good deal, as it's a slight thing - but there's some nice paint, the figure is good, and it's different enough. Get it if you see it and especially get it if you skipped Ezra's bike. 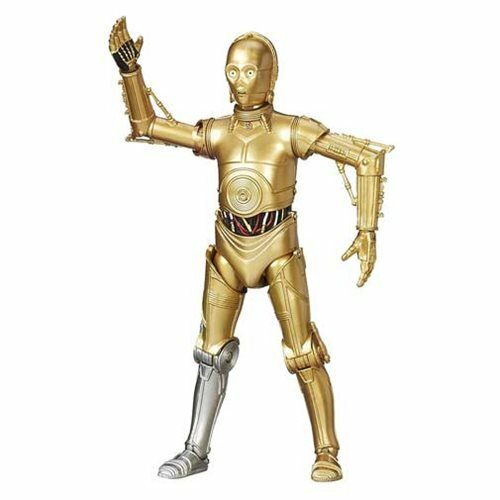 I mean, we're getting actual, new toys of the Galactic Empire now - no "First Order," no Separatists - this is more or less Mini-Rig and Original Trilogy fantasy land now. We're living in it. Purchase accordingly.